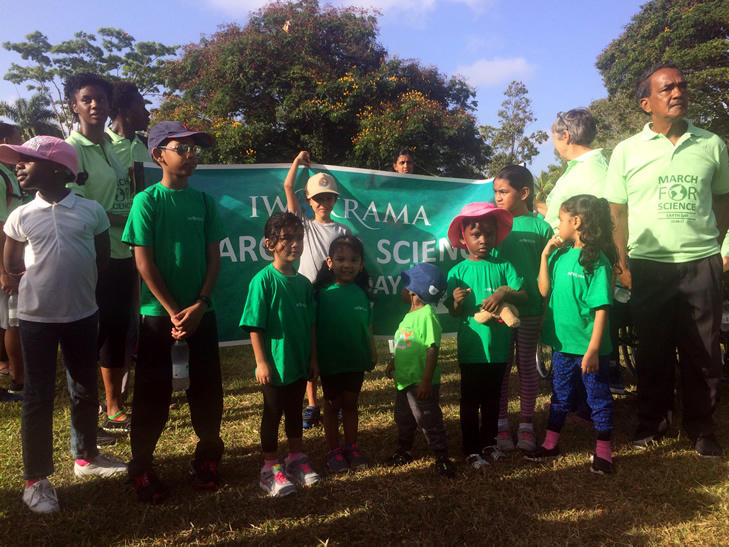 On Saturday April 22, Iwokrama joined the rest of the World to celebrate Earth Day; the largest global, environmental movement, celebrated by over 1 billion people worldwide. Use Environment and Climate Literacy as the engine to drive our green economy by encouraging youths to learn about green technology and green careers. 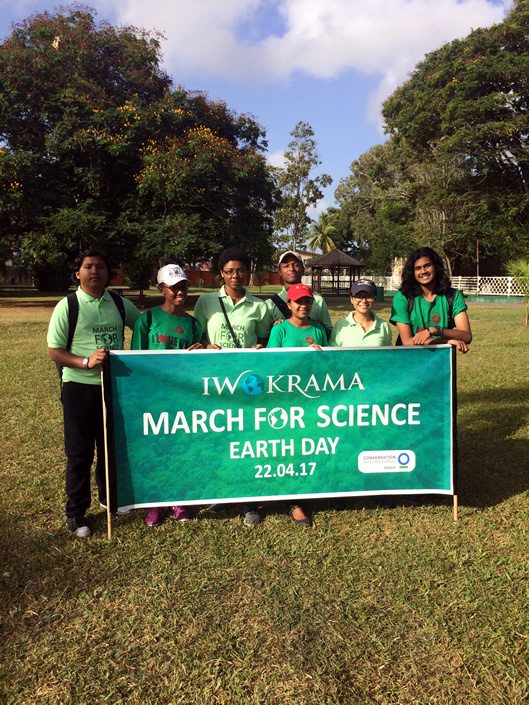 Among the four main activities planned for this year’s Earth Day Campaign in Guyana, Iwokrama was happy to lead the largest one – MARCH FOR SCIENCE. 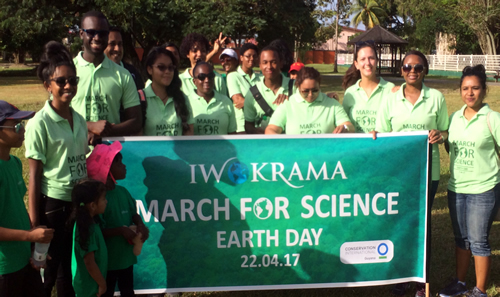 Read the full "Earth Day Press Release - PDF"
The March for Science is not only a celebration of science but a show of respect towards the importance research and discoveries have on our everyday lives. 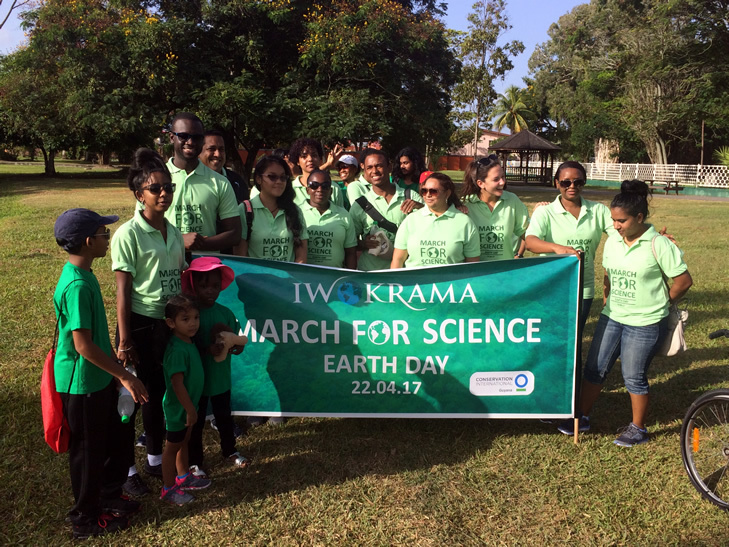 The March for Science is an unprecedented global gathering of scientists and science enthusiasts joining together to acknowledge the vital role science plays in our lives and the need to respect and encourage research that gives us insight into the world. Science has no political stance, it serves all of us, it protects our air and water, preserves our planet, saves lives with medical treatments, creates new industries, puts food on our tables, educates the next generation, and safeguards our environment for future generations. 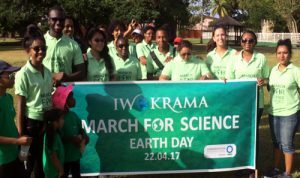 This year was the debut of The March for Science- starting as a non-partisan movement in Washington DC, the concept soon spread to a global movement with scientists worldwide joining together to show their support for the cause. 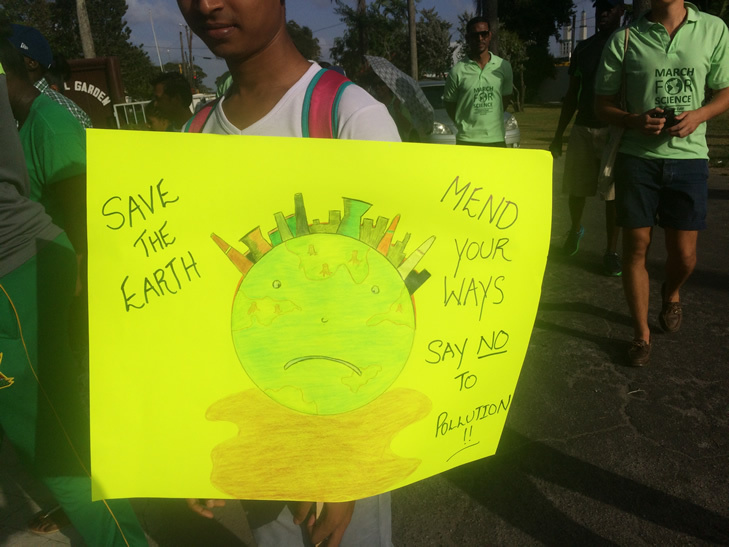 Earth day saw 69 countries participate and over 600 marches take place. 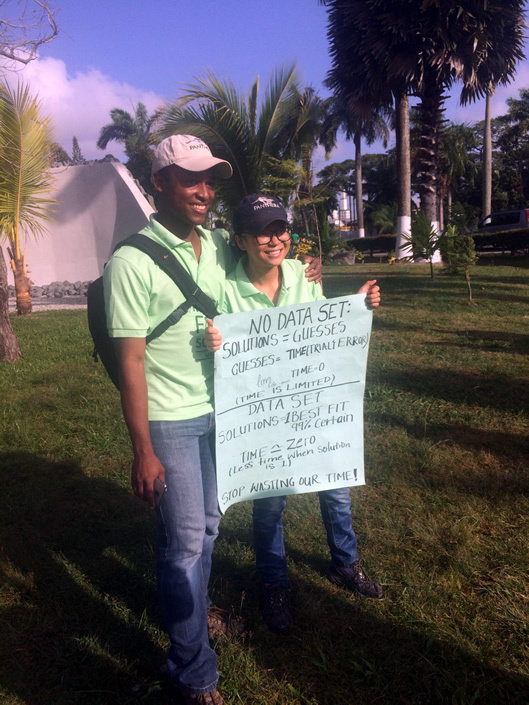 Iwokrama is proud to have represented Guyana on the global stage for this event. The March began at the National Park and participants walked from this point to the Botanical Gardens via Vlissengen road. 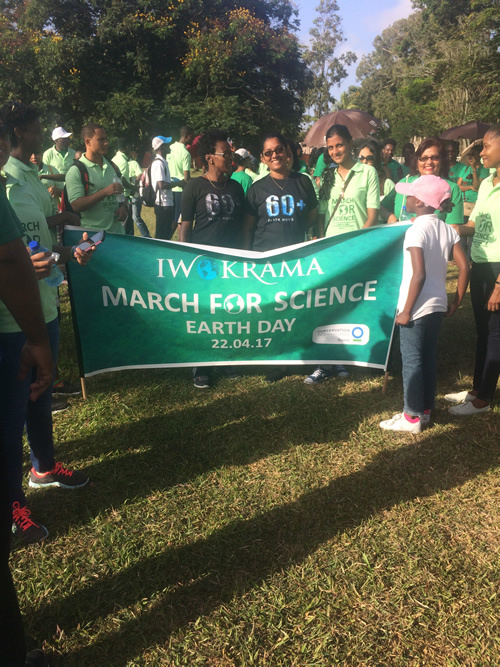 Over 100 scientists, students and science supporters turned out to march with numerous banners in tow. Iwokrama would like to give thanks to all sponsoring agencies, Ministry of Natural Resources, Environmental Protection Agency, Conservation International and Banks DIH for providing Rainforest Water. 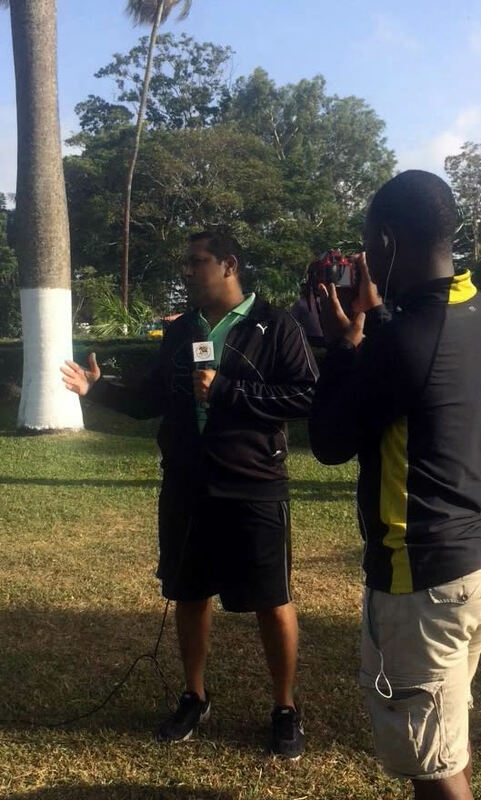 Special thanks to all supporting organizations and Individuals, University of Guyana, CYEN, WWF, GFC, Fisheries Dept., Protect Areas Commission and the Guyana Police Force for making this event possible.